Wherever you happen to be waking up this morning, you’ll definitely want some nourishing fuel before continuing on this self-driving tour. A great breakfast place in the main township of Bright is Coral Lee’s on Barnard street, serving local fish and meat, pumpkin muffins and the best espresso in town. Another option is down Gaven street at the Riverdeck Cafe. This is a fun idea if you went to Cafe Prevue from Part 1 in Wangaratta because it overlooks to same Oven’s River. Something nice about a little continuity to guide you on your way. The river itself is a lovely stop on your way out. 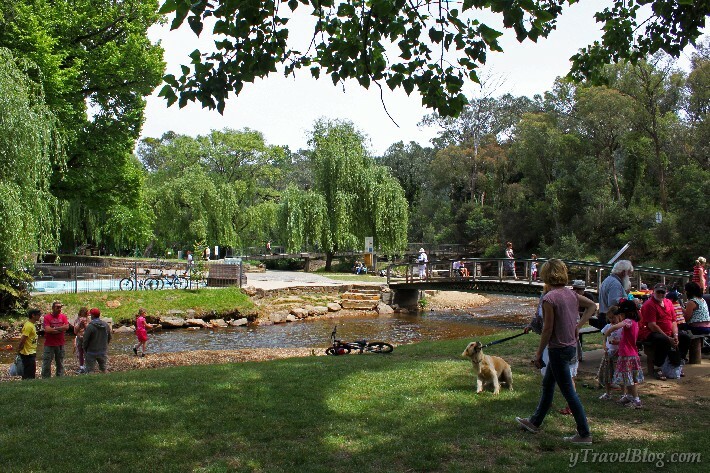 Head up Riverside Avenue to Howitt Park and enjoy the quiet bustling of local families enjoying the trees and shady grass along the water’s edge. Families, friends, and dogs head to Howitt Park to enjoy the Oven’s River in Bright. Now that you’ve dined and leisured it’s probably a good time to hit the road, The Great Alpine Road to be exact. So make sure the sign says the B500 and that the road is heading rather South. Just a short ways past Bright is where this wonderful road starts its ascent into it’s more characteristic mountainous section. Speaking of mountains, as a reminder from post 1, it is required to have chains from Harrietville onwards during the ski season between June and October. Speaking of mountains again, you may get some spectacular views of Mt. Feathertop just North East of Harrietville. This towering snow-capped monster is Victorias second highest peak, and can be accessed on foot via the Razorback Walking trail roughly 21km from Harrietsville, on the left. Word of caution however, it is a 26km loop to Feathertop and shouldn’t be taken as a spontaneous stroll into the bush. 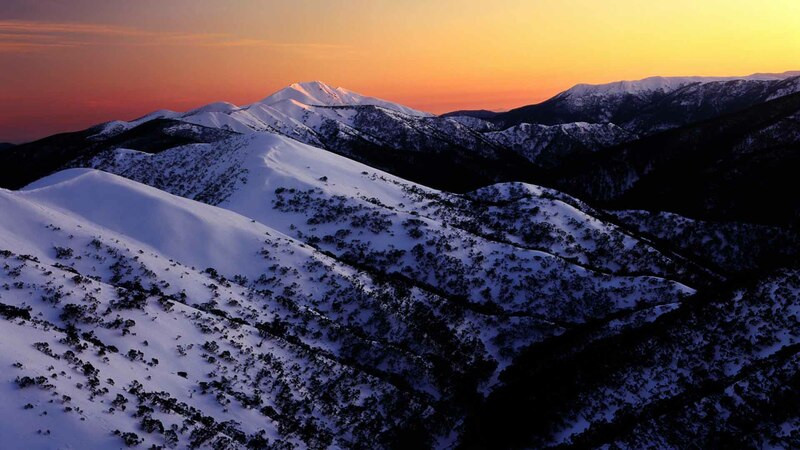 Trekking toward the snowy peaks of Mount Feathertop on The Razorback Trail. Regardless of whether you opt for some bushwalking, there are some incredible views to take note of as you make the winding and often narrow road up towards the summit. Part way up you’ll notice that the landscape has changed into Mountain Ash Forests and later into Stringy Bark with expansive valley views in the background. Once you get to the actual summit, you’ll be able to take in an eye-full of Alpine National Park over the other side. From this point there are almost 30 kilometres that traverse right along the ridge, allowing for breathtaking views on either side. The roads can be very icy near winter but almost more dangerous is the temptation to look out of both windows while you’re driving. It’s a great idea to stop at some of the rest areas to take it all in and take some cool mountain air into your lungs. soft morning light on Alpine National Park from the Great Alpine Road. You’ll also pass through the Mt. Hotham’s Ski Village where you can, of course, go skiing but you can also take a bushwalk out from Mount Hotham towards the Bogong High Plains. In the summer time this snow gum lined track winds through fields of wildflowers past the historic mountain huts. 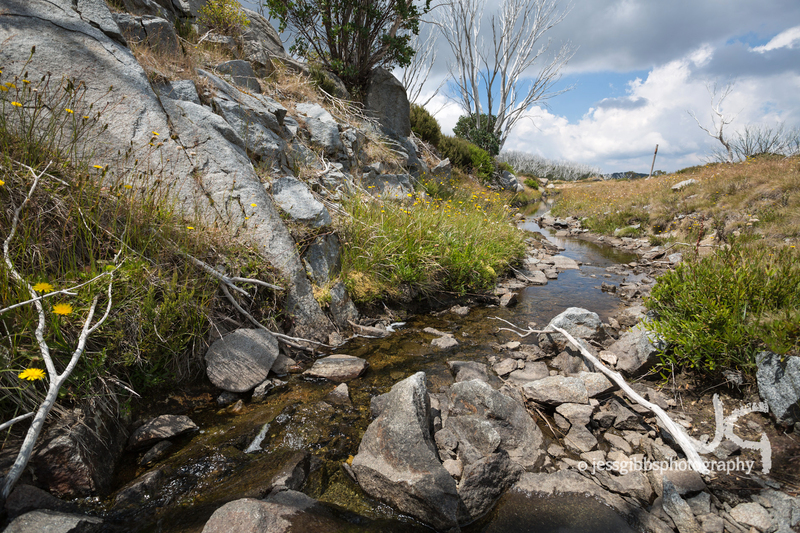 A quiet stream making it’s way through the Bogong High Plains. Once you leave the ski resort there is a very slight descent towards Dinner Plain, an alpine village about 10 kilometres from the summit. Not only is this a great place to base yourself if you want to explore all that the Alpine National Park and Mount Hotham have to offer, but it’s know for it’s particularly interesting architecture. The town’s buildings were designed by architect Peter McIntyre who used only the allowed timber, local stone, and corrugated iron to build in the fashion of the pioneer’s and the old cattleman huts. The town is also the only freehold land above snow line and is somewhat of an icon for Australian Alpine Villages. 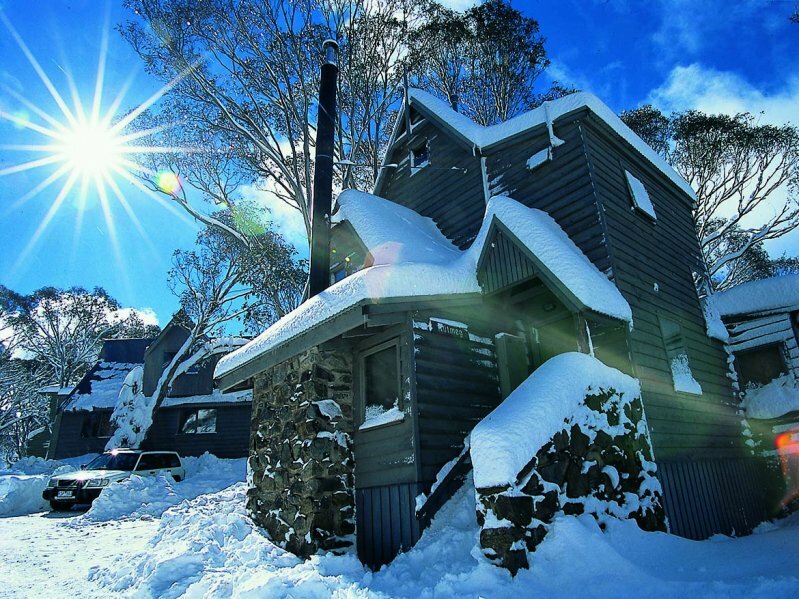 It might be worth staying a night here and exploring the nearby bushwalks or free-entry ski areas. The iconic pioneer architecture of Dinner Plain. From here you begin the real descent towards Omeo. This stretch is just under 50 kilometres and can be done in about 45 minutes, but you might like to extend it a bit longer. As you drive you may notice a few mountain peaks in the distance on the lefthand side. Pull over for a better look because, on a clear day, you’ll be able to see across the one hundred kilometres to the peak of Mount Kosciuszko and Mount Townsend in NSW, the highest peaks in the country. Making the descent towards Omeo with mountain views and winding roads. Omeo itself is a good pitstop if you need to top up on snacks or rest your weary driving eyes for a moment. It’s a historic gold-mining town but it hasn’t been overtaken by tourism, so it still has an authentic feel. You’re still roughly 700 metres above sea level so the air is rather crisp and refreshing. 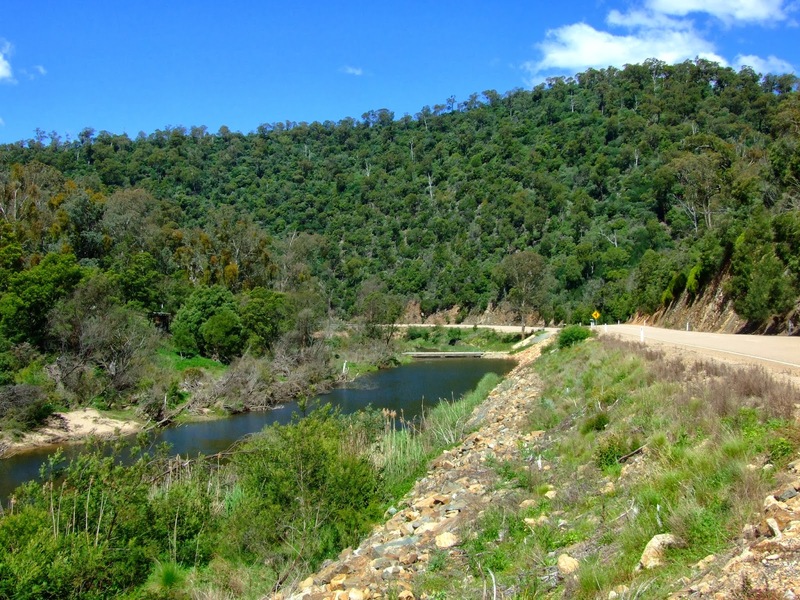 As you continue the drive you will pass Swifts Creek in the Tambo Valley and then the drive follows alongside the beautiful Tambo River. Even if you don’t stop to have a look, this stretch of the way has a lulling beauty as you trace the curves of a flowing river. On you’ll go through dappled light of forested road until you reach the lowlands of the nearly coastal town of Bruthen. Following alongside the rushing Tambo River on the way to Bruthen. The road officially ends a bit further west at Bairnsdale but by now you are well and truly out of Alpine territory, and things start looking like the average coastal highway. There are plenty of lovely beach camping spots along the way home or you can push the last 300 kilometres and sleep tight in your own bed. You’ll be dreaming for days about snow-capped peaks, quiet trails, and the calming rumble of the road beneath you.